This article is about the town. For the river, see Arthur River (Tasmania). 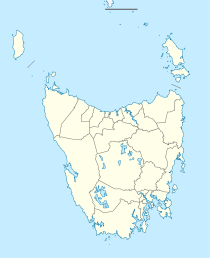 Arthur River is the name of a small township on the northern part of the West Coast of Tasmania, Australia. At the 2006 census, Arthur River and the surrounding area had a population of 121. It is south of the town of Marrawah. Named after Sir George Arthur, Lieutenant Governor of Van Diemens Land (1824–36), the town draws its name from the river. The river is fed by several tributaries including the Frankland River, which was named after its discoverer, George Frankland, then the colony's surveyor-general. The region has been exploited commercially for timber and fisheries, but today is mostly a centre for tourism. ^ a b Australian Bureau of Statistics (25 October 2007). "Arthur River (State Suburb)". 2006 Census QuickStats. Retrieved 18 August 2007. Sharples, C.E. (1997) Karst geomorphology and values of the tarkine: limestone, dolomite and magnesite karst systems of the Arthur-Pieman Region of Tasmania: a report to the Australian Heritage Commission and the Tasmanian Conservation Trust Inc. Canberra: Australian Heritage Commission. This page was last edited on 8 April 2019, at 13:15 (UTC).